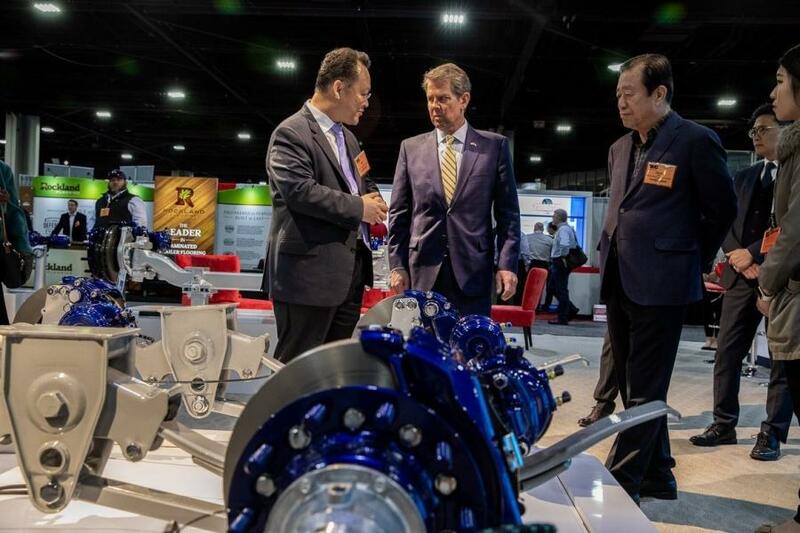 Kemp stopped by Sangsin's booth at the Technology & Maintenance Council (TMC) Annual Meeting & Transportation Technology Exhibition (TMC 2019) at the Georgia World Congress Center to celebrate the news. "I am excited that Sangsin Technology America chose to expand its North American footprint in Georgia," said Kemp. "More and more companies from across the globe are calling the Peach State home, and we are confident our state's longstanding relationship with Korea will continue to bring significant job and investment opportunities to our state." Founded in 1975, Sangsin opened its doors as the Sangsin Chemical Industrial Company, focused exclusively on manufacturing brake friction products. Today, Sangsin manufactures friction products for both domestic and overseas companies in more than 90 countries and is now Korea's largest brake manufacturer. This new 220,000-sq.-ft. manufacturing facility in Henry County will house the company's first U.S. manufacturing operation as the company expands into the heavy duty brake systems industry in the North American market. "Henry County welcomes Sangsin Technology America to our community," said June Wood, chair of the Henry County Board of Commissioners. "The company's decision to choose Henry County for its first U.S. manufacturing operation is indicative of our ongoing commitment to be a global destination for business." "It's a testament to Georgia's strong manufacturing network when cutting-edge companies such as Sangsin Technology America choose Georgia to locate their new North American facility," said GDEcD Commissioner Pat Wilson. "I am confident that Sangsin will find success in Henry County."